I led and project managed this HIA that was part of a Strategic Environmental assessment (SEA). Overall, the proposed set of objectives and interventions strongly aligned with public health and wellbeing objectives and are likely to have potential positive health and wellbeing impacts on most residents of Northumberland. These positive health and wellbeing impacts are likely to be realised within the duration of the LTP3, 2011-2026 with a strong potential for these positive impacts to continue beyond this period. 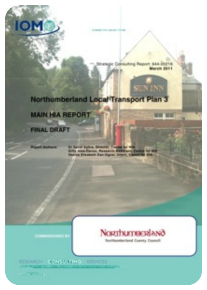 The potential impact of the interventions experienced across Northumberland is likely to depend on the final set of preferred interventions chosen from the proposed set. Prioritising the intervention themes as follows is likely to be most beneficial to the health and wellbeing: Non Motorised Users, Public Transport, Road Safety, Miscellaneous, Climate Change, Smarter Choice, Freight, and Highway Capacity. The major negative health and wellbeing impacts are linked to the construction of new roads and rail links and generally occur during the construction phase and on residents who live near the new road or rail routes and the widening of existing road routes. These issues are best considered when more detailed proposals are developed through project-specific EIAs and HIAs. They are also generally short term, temporary and generally localised.